links - Doctor Who Screencaps - It's Timey-Wimey!Doctor Who Screencaps – It's Timey-Wimey! Dads of Doctor Who – Vote! The BBC have voting open on their Facebook page for the best dad. The Doctor himself is not on the roster, but that’s only fair – the others at least get a chance. Who’s your favorite dad? Have fun making up some of your favorite episodes. Wouldn’t you totally watch this? No? Try again. The BBC notes that today is the fifth anniversary of River Song’s appearance in the Library. Included are quotes, a list of River Song episodes, a quiz, a special gallery, and a poll regarding your very favorite episode. … along with a woman and another man. But when the bar is The Way Station and the people are Steven Moffat, Sue Vertue, and Matt Smith, what’s already a special occasion becomes even more special. This is also the introduction to an essay about Moffat’s vision of the Doctor as a monster. I find it intriguing. I don’t normally report on deep philosophical or literary discussions because this isn’t that kind of blog. And I don’t normally find those sorts of discussions in Reddit’s /r/doctorwho because it’s not that sort of subreddit. /r/doctorwho is normally for the fluffy and fun, the wowie and the cute. /r/gallifrey is where you put the esoteric stuff. And yet here’s an exceptional thing. [Danger – all the following links contain spoilers if you are not caught up.] NoMoreMrSpiceGuy has posted this interesting thesis on the many allusions between the Doctor and the devil that have been made during Moffat’s run as showrunner. Not at all as dull as it sounds, and there are some intriguing ideas in there about what these allusions might mean and why. I don’t necessarily agree with all the points the author makes, but this is fun stuff to think about, and the comments are interesting too. Bonus compatible theory – why the Doctor chose the name that he did, posted by silverraider525. I like this. Again, I don’t agree on every single point, but find the general assertion quite plausible. I had not seen this before, but the BBC website has this tool that walks you through a process to discover what classic Doctor Who episode you’re thinking of. You start with a type of monster or a type of event and move on from there. Rather fun! Images for Journey to the Centre of the TARDIS were released today. This one chilled my blood cold. Click for bigger. Thanks Bad Wilf for the posting. 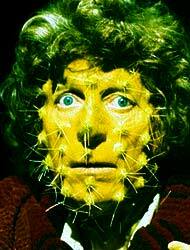 The Guardian’s blog Datablog posted this project to detail every Doctor Who villain since 1963. You can even download the datasheet. There have been lots! A little while ago, while I was out of the loop, Doctor Who TV posted breakdowns for two trailers for series 7.2. I’m finding them intriguing. Did you not see this coming? I did.